Yesterday, as I'm sure you were probably aware (especially if you happen to follow me on Twitter and endured my never ending stream of correspondence) was Summer of Sonic! 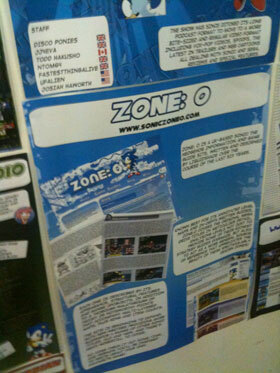 The British Sonic convention that offered just about everything a Sonic fan could dream to see and do! I had an absolutely fantastic time, everyone involved in putting it together should be incredibly proud of their work! It was brilliant! There wasn't a lot more that it could have offered really, we got to play Sonic 4, both versions of Sonic Colours, and even got to see Crush 40 playing live! Unbelievable day. 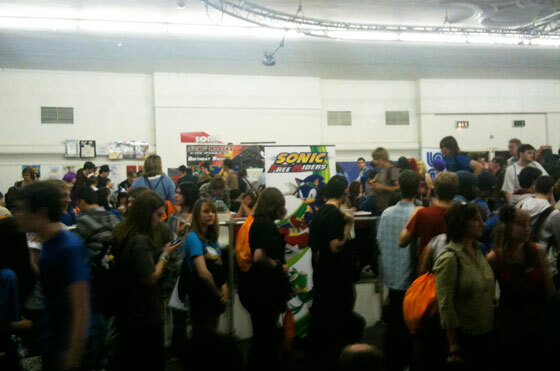 Turning up at what I thought was an early time, the sight of a massive, disorganised crowd of eccentric people wearing Sonic clothes, Sonic bags, holding Sonic plushies and dressed in Sonic costumes or with Sonic hairstyles was a sight to behold. I've never really met many people who are as passionate about the blue one as I am, so it was particularly thrilling to me, not to mention eye opening to see how people with a little more self confidence than I possess visibly express their love of the series! I prefer the more subtle "spend years quietly building a massive shrine of a website" approach, so it was remarkable to me! An impromptu crowd sing-a-long of the City Escape theme was a particularly nice touch. Before long, we were asked to form a more orderly queue, in which we would remain for about another 45 minutes-1 hour, as the opening was slightly delayed. Slight rain, constant barrage of really tiny wasps attracted to bright colours, and passing "normo's" with very confused expressions on their faces at the sight of a massive queue of fans for something that probably hasn't even particularly entered their heads in years were all reasons for which I was eager to get in, not least of all though because Sonic 4 was waiting for me inside! Given the size of the queue, I was relatively close to the front of it, so I thought my chances of getting near the start of the Sonic 4 queue inside were reasonably good. They can't ALL be joining it right away, right..? 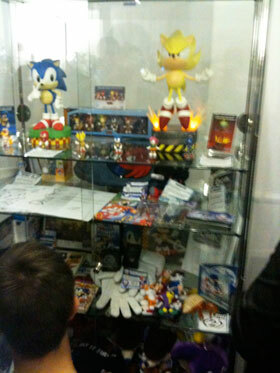 Upon entry, we were each given a lovely goodie bag of stuff, including an Archie comic, but more importantly, a frankly awesome brand new Metal Sonic mini figurine. 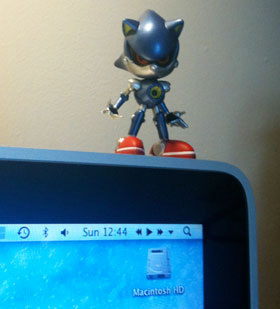 Mine now sits atop my computer monitor, glaring directly at me as I type. Undoubtedly one of the coolest things EVER. 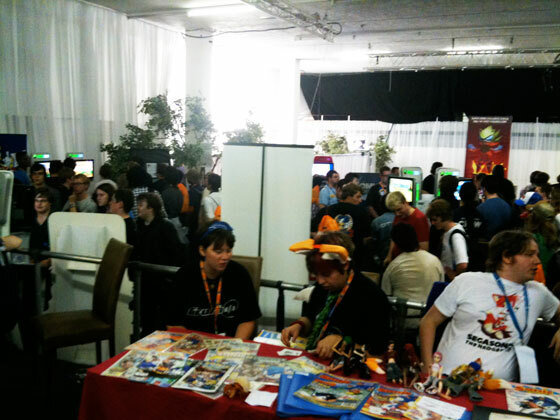 Walking in to the quite large room, there were tables with stands around me, and steps leading down to the XBox 360 games pods on the left. Down further still was the stage area. 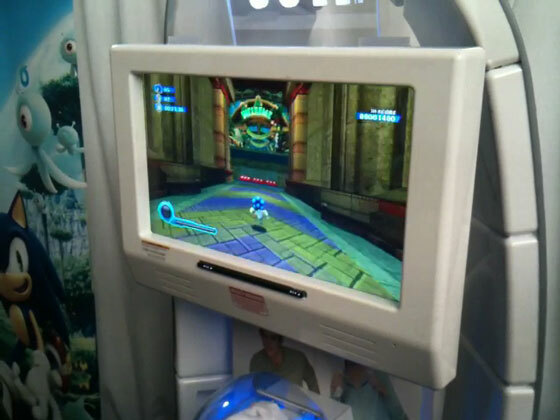 There was a circle of machines devoted to the ongoing Sonic and Sega All-stars Racing tournament (which I practiced for, but sadly didn't get a chance to enter - which is no great loss really, there's no way I would have come close to winning! ), plus a few classic titles, Sonic Heroes, Sonic Unleashed, but far more important on this particular day were the two pods on the far left dedicated to the in-development Sonic the Hedgehog 4! My first mission was to join this queue immediately upon entry, which is exactly what I did. The queue wasn't too bad when I joined - there were maybe 20-30 people in front of me, and I was there for about an hour all in all, which was more than worth it to me for Sonic 4. The people behind me however, went back for MILES! It wasn't moving particularly quickly either, because almost everyone wanted their share of all three acts of Splash Hill Zone, plus the boss. By the time it got to just a few people in front of me, the powers that be decided everyone was taking too long, so intervened to impose a limit of two acts each upon us. That was fair enough I guess. It left me with a small dilemma though - what acts to play? Even now that you can officially see all three acts being played on numerous gaming site videos, I've still only allowed myself to see Act 1 in full play. But since I know it pretty well, do I go for Acts 2 and 3? I decided no, it was only right to start my experience with Act 1, so it would be 1 and 2. For a reason that would become clear soon enough, I would regret this decision. Finally the time came, and with somewhat shaking hands and a quickening heart beat, I held the much-fondled controller and selected Act 1, under the watchful gaze of a show assistant who appeared to have come straight from the set of the Fresh Prince of Bel Air. Not to worry Will Smith, I would gracefully accept my chosen two acts and play no more than that, you'll get no trouble from me. All I really wanted was an understanding of how the physics felt anyway. As it would turn out, not too shabby really! It's different, I'll give you that. It doesn't feel exactly like Mega Drive Sonic, but I'm not one of those people who necessarily thinks that's automatically a bad thing. If it's versatile enough to comfortably handle both slow platforming and high speed looping, how wrong can it be? The acceleration was the first thing that struck me. Sonic's comparatively slow to start moving, feeling a little heavy, but you don't have to hold the stick long for him to dramatically pick up pace. I daresay there's still some refinement to do here, in striking that balance and perhaps the transition between the two states, but I think it'll work, even though it takes some getting used to, though this is much the same for all the different types of 2D Sonic. The homing attack felt responsive and useful, and I think it'll be a worthwhile addition. You seemed to even be able to use it in states that you perhaps wouldn't have thought, like having come up through the air after a curved wall, and not in spinning mode, so it doesn't seem to have to follow a jump, necessarily. The spin dash and rolling spin seem powerful enough, and the jump didn't particularly feel wrong either, although like the general physics, it'll probably take some getting used to when playing, just because they're not necessarily exactly like the classics. Things that I thought might be annoying turned out not to be so when playing. That unnecessary dust trail barely even registered to me, and though before I thought Sonic's new spinning leg animation seemed a bit OTT in some ways, when it actually hits while you're running through loops (and it doesn't appear particularly early in Sonic's range of speed), it actually elicits a certain small, nostalgic fuzzy feeling - it just sort of feels right, and I'm glad it's been included. Everything else I could say about level design and flow, you can see for yourself in all the various videos and you've probably already formed your opinion, but personally, if Act 1 is anything to go by anyway, I think Splash Hill is a very carefully considered demonstration of the real "Hill Zone" type level design, in the way that it flows rather fluidly from platform to platform leading right, and with the perfect high, middle, low formula of multiple routes, all with gaps in between them in which you can chop and change as you go. Following a successful introduction, I fired up Act 2 manually, as they didn't flow one after the other automatically in this demo. It was at this point that Will Smith interjected. Suddenly I was allowed only one act. What..? You said two! I tried bargaining him down to half an act, but he was having none of it. Not one to cause a fuss, I reluctantly agreed to relinquish the controller, the very first person in the whole day to have this limit imposed upon me, which presumably ran for the rest of the show (or at least I would hope it did). I didn't particularly mind having only one act to play, it was enough to get the taster of the game I'd wanted, as the acts are reasonably long, but had I been told beforehand, I would have chosen Act 2, and would have been able to get the full experience of not knowing what was coming. I wasn't fuming about it, but it was a bit annoying, as it meant I didn't get quite as accurate an impression of the game as I was hoping to, and to reveal to you in this preview too. Still, on the plus side, it means the virginity of Acts 2 and 3 remain intact to me, ready to be.. ahem.. deflowered upon release of the actual game, and that makes them all the more special I guess. They'll be more enjoyable with full audio and in the comfort of my own home. With tired legs, I retreated to the convenient sit-down area, to tweet a bit, and then decide what I wanted to do next. 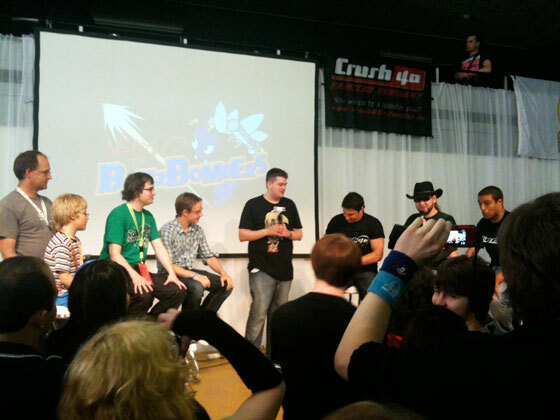 Sonic Colours was being held on the lowest level, by the stage. 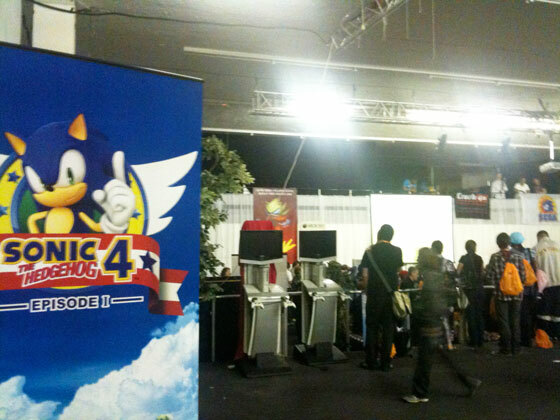 It had a shorter queue than Sonic 4, but still quite a long one, and I didn't have the energy to join it at that point, so I thought I'd take the opportunity to poke around a bit first and see what else the convention had to offer. The stage area would become a pretty entertaining place, hosting things like the "Wrecks Factor" which was actually painful, and quiz show "Nevermind the Buzz Bombers", in which contestants answered Sonic trvia, which was great fun. Dreadknux and AAUK lead most of the on-stage segments, and very entertaining they were too. I managed to introduce myself to both of them during the day, and briefly say hi, which was pretty cool. During the quiz show I started to realise I was standing around anyway, so I might as well make a start on that Sonic Colours queue, which was nearby, about 30-40 people strong. As it would turn out, this decision would occupy a very large chunk of the day. It soon became apparent that unlike Sonic 4, no one was imposing any kind of limit on how many acts each player was allowed, so everyone was taking about five minutes to play through both acts of either Tropical Resort or Sweet Mountain Zones, plus the Tropical Resort boss. The DS version was nearby, but there was only one Wii console, and of course most people wanted to play both, so this would be a long, long wait. 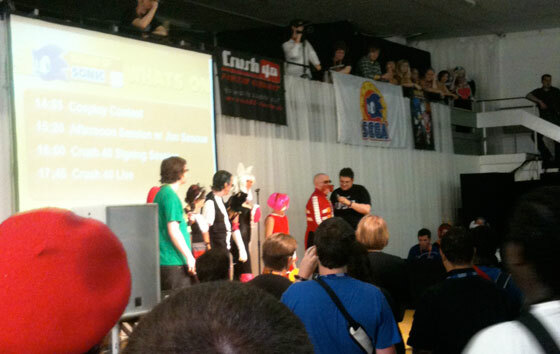 Fortunately, in addition to chats with fellow "queue victims", entertainment was on hand on the stage, in the form of the cosplay contest, which was won by Dr. Eggman, despite threatening the entire audience, I believe. This highlighted some of the more.. "zany" fans that attended the show. Some fans, cosplaying or not, I'd give the term "zany" to, and a few I might even suggest "ever so slightly unbalanced" be more appropriate. Still, it was all in good fun!.. as long as you kept your distance from them. Luckily, Jun Senoue was also around. Before his big Crush 40 gig at the end of the show, he treated us to some instrumentals of a range of Sonic music that he had created, including Splash Hill, Station Square, Seaside Hill, Emerald Coast, and was even joined by singers to belt out another rendition of Escape from the City (slightly more professional than the one I'd heard earlier)! This was all brilliant to hear, and such a rarity. Everyone goes crazy for the vocal songs, but I love to hear these tunes done live. Absolutely brilliant! 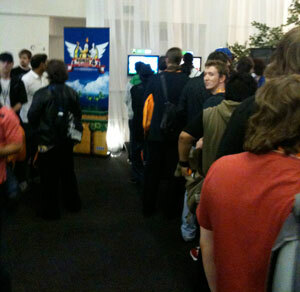 After what seemed like years, I was finally nearing the front of the Sonic Colours queue, which sort of formed into a tightly knit gathering of fans huddled closely around the console, after having seen both levels played out in full dozens of times already. Slightly hidden behind them were two DS's, oddly only one of which contained Sonic Colours, but the queuing system for this was rather less organised and there seemed to be an agreement that anyone in the "Wii huddle" could just take time out from queuing to have a quick spin on the DS. So this is what I did. Like most people, I think I'm a lot less excited about the DS version than I would be, say, Sonic Rush 3, purely because the Wii completely eclipses it. But at the same time it's different enough to feel like a whole other game, following a similar trend to the two versions of Sonic Unleashed. In this demo you could play one act from either of the two levels and a boss. I gave Tropical Resort a go, and was confronted by a slightly long winded list of instructions that I attempted to apply to my existing knowledge of how Sonic Rush games work, but quickly gave up and just went on in to attempt to figure it out as I went. This was an easy enough task. The game looks and feels exactly like the Sonic Rush games, there's no detectable change to the way the physics or level design principals work. The most significant changes are in the moves department. Gone is the trick system, despite my habitual presses of the shoulder button, and homing attack has been moved to one of the main buttons. You can boost, which I think is a different button to the more general wisp button, and the main wisp on offer was the fire wisp, which transforms the whole of Sonic's body into a flame version of himself. During this time, you can press the wisp button (which is either X or Y, I forget which) and press on the D-pad to burst in a particular direction after jumping. It seemed a bit fiddly though, as you can't tap continuously, there's a short period of time in which you have to wait after performing the move before you can do it again. It's not ages, but it's long enough to make you realise it exists. Like in the Rushes, there's a nice enough 3D segment at the end of the level that sees Sonic clinging to a hang glider, dodging spikeballs. I only saw Sweet Mountain in action and didn't play it, but it seemed like quite a long level, with several unique objects like wobbling jellies for springs and jelly bean rockets. The length of these levels and the fact that there was only one act each of them makes me wonder if, unlike the Rushes and just about any 2D Sonic I can think of, do these DS levels come in only singular chunks? Could be. I also caught just a bit of the music, and it sounded like the same basic tune to the Wii's Tropical Resort. Finally, the time had come! By this point I'd been involved in this queue for probably close to three hours! As I mentioned above, it's not as if there was nothing to see and do in the meantime, so as far as three hour queue's go, it was one of the best. But still, my legs were absolutely aching, and I was very tired. Despite the fact that, visually, I prefer the idea of Tropical Resort Zone over Sweet Mountain, I've seen less of the latter, so I went for this slightly controversial food-based level. It would also be slightly more challenging, so would allow me to get a feel of how the engine works with these challenges. What's worth mentioning at this point is that due to syncing problems, a Wii remote was not available for use with the console, so instead we relied on a trusty (and very sweaty and slippery by the time it found its way into my mitts) Gamecube controller. Unfortunately this build of the game hasn't yet been tailored to provide on-screen button hints that relate to this controller, only the Wii remote, so players were somewhat on their own when it came to figuring out what does what. For the most part, it's fairly straightforward though. A is jump, B is boost (when you have the appropriate wisp), and Y is slide/duck. The slightly hidden Z button on the shoulder is used to perform the relevant wisp action, which in these levels was limited to the drilling wisp and the slightly odd laser wisp. How to pull off the drift move around corners is something that no one could really quite suss out on the GC controller. I'm pretty sure the homing attack was relocated back to the A button, having done a lot of flirting with X or B buttons in recent games. It feels very very similar to Sonic Unleashed Daytime on the 360, which in my book is not even remotely a bad thing. 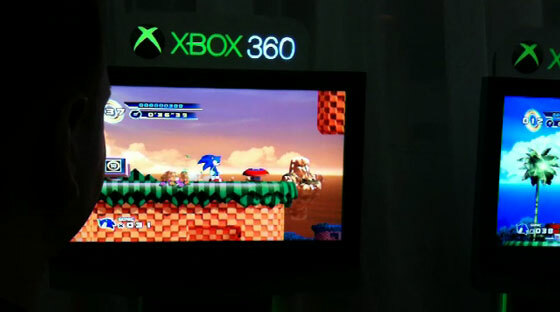 With Sonic 4 providing classic level designs, this game should have no fear in going fully "new-school" on us. A mix of 2D and 3D segments, only there seems to be a bit more of a slant towards the 2D, and these sections tend to last longer too. Challenges are reasonably satisfying, and there are always new twists and turns along the way, as you'll know if you've seen the videos. I was probably most eager to try out the new Wisp moves however. The drill is about as fun as it looks and has Sonic burrowing through the ground at speed, with mechanical moles in hot pursuit. You can burst out of the ground on any side, but there's a certain knack to hitting tube entrances leading out of the sides, and not bouncing off of the edges, which change your direction and force you to loop back through and try again, ever mindful of your meter running out, although this seemed to be quite generous. It's in these kinds of features that the multiple routes and secret areas are apparent. I'm not entirely convinced that the routes available in the game will be too far removed from those of Sonic Unleashed (i.e. quite short and sweet diversions or shortcuts rather than whole other ways through the level), but I think there might just be more of them. At one point, an incorrect route brought me back to an earlier point, similar to the kind of thing seen in Savannah Citadel. The laser move was a bit more complicated, but rather interesting all the same. A press of the Z button seems to freeze time and has Sonic spinning stationary in the air, during which time you can use the stick to select a direction to point towards, which seemed like a little bit of a slow process to control actually. I thought it would be more intuitive to hold the Z button while you do this but you actually have to press to initiate the move, and then press again to fire Sonic in that direction, as a laser. I guess that's because it's normally triggered by shaking the Wii remote. You can use this to aim at diamond objects that send the laser beam along a particular course, or just point pretty much anywhere, and it'll bounce off of any wall of object until, I presume, the meter runs out. Clever idea that seemed to work quite well and many players used it to get through barrages of enemies as well as reach high points they can't get to by jumping, although I wonder how easy it might be to fall to your death using it over precarious platforms. There were some slight glitches present in this build. On more than one occasion when players were hopping across grind rails in Tropical Resort, they would accidentally leap from the center rail, over the side one they were aiming for, and straight off to their deaths. Also I noticed in one person's game a hidden spring off to the side of the start of Sweet Mountain that I tried homing in on myself, but a glitch made me fall for some reason, and I should have been able to get to it. The odd slip up now and then is to be expected, but it'd be massively unfortunate if this sort of thing plagued an otherwise very well built, well designed, and creative game. Hopefully this version isn't quite final. I wish I could say I really enjoyed Sonic Colours more, and I don't think it's the game's fault that I didn't, I think it's more of a mix of having to wait such a long time for it, tiredness, and the fact that these one level playtests don't really give you a full idea of how you really feel about the game. It's only a taster, and as a taster, it turns out the game feels pretty much like I expected it to anyway. I might have enjoyed Tropical Resort more, but something crucial was missing on all of the games I played today - sound. Music and sound effects are so vital to the full Sonic experience. They help colour the level and bring it to life. I know the place was noisy anyway, but just having the volume up a little more would have made quite a difference I think. Still, don't get me wrong, it's a good game and I look forward to it greatly, as should you! Nothing I played today was bad, I just wanted to play more of it!! Feeling like I was about to fall over when I started a full walking pace away from the Wii, I sought a place to rest before the day began to wrap up with a live performance by Crush 40! I must say, they were very entertaining, particularly Johnny Gioeli, who was really up for a laugh with the audience, cracking jokes whenever he was on stage throughout the day. He'll take any excuse to spontaneously burst into song. They played most of what you'd expect them to - Open Your Heart, What I'm Made Of, Sonic Heroes and of course Live and Learn, as well as some of their non-Sonic stuff, and the crowd was loving it. Everyone was singing (or, really, shouting) along with every word, with their hands in the air, and it was a pretty special experience for any Sonic fan I think. I took videos but the sound wasn't recorded particularly well, so hopefully good quality vids will emerge on Youtube soon, if they're not there already. And by about seven, the show was over. I wanted to see if I could sneak another go on Sonic 4, but alas the consoles were turned off before the Crush 40 gig, so no such luck there. I wanted to introduce myself to Kevin Eva/AAUK before I left so he could finally put a face to the name. Understandably he was about as exhausted a man as I'd ever seen in my life, but still very nice, and with that I was pretty much on my way! Well the whole thing sounds like it was a lot of fun. I'm glad to hear about your experiences with Sonic Colors. Being someone who truly enjoyed Sonic Unleashed, I'm really looking forward to this game. It's too bad about Sonic 4, though. Not really fair to impose the limit on those already playing, but what can you do? I'm seriously going to consider flying out and attending next year. Hopefully there'll be as much entertainment as was at this one. A great report, overall. Perhaps you'll find some new visitors to the site now, hopefully making the forums more active (something I haven't exactly been helping to do either, admittedly). I too was there and it was really an amazing experience, considering I'm the only one in my circle of friends which likes Sonic the way everyone in this convention did. I enjoyed it a lot! Playing Sonic 4 was amazing! Didn't get a change to play Colours for the Wii (although i did for DS). The only downside about this (and I'm not blaming them) was the merchandise, I was hoping to see a bit more things other than the comics and few figures. 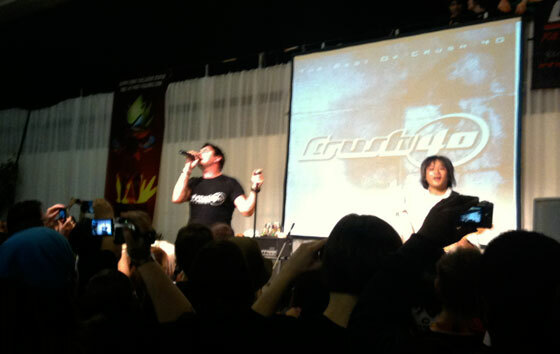 Crush 40 were also awesome to hear. It's always great to hear bands like these live, you're guaranteed a laugh with these people. All in all, a great experience to have and any Sonic fan should attend this, regardless of how much they like Sonic. Wish I could've come! And sorry Will Smith cut your playing time short! Colors looks quite fun! As for 4, I'm glad to hear it handles somewhat close to the originals. I'd appreciate the sentiment, though, if SEGA continued to tweak it. Glad to hear the level design is solid, however! Wow, that sounds as if it must have been loads of fun! Unfortunately for me, I was unable to get to the UK from this here US, so I was stuck seeing pictures and reading posts like this one. Sonic 4 and Colors seemed like quite some fun, and I kinda decided to change my idea about it. Anyways, do you know of these that happen in the US that I could possibly attend? Wish I could have met you at SoS dude, you have an awesome website! Keep it coming, and maybe I might be able to catchya next year!